Mike Haggar is more or less THE definition of BADASS, and i am sure the developers of Borderlands (Gearbox) thought @ Mike when they added those BADASS ranks ideas to their Borderlands 2 game. Filip Acovic, serbian artist known for his outstanding “real life” portraits of the Street Fighter II characters and a ton more great artworks draw this as a break from those SF Character Series Illustrations and also for the “FGE Project” i organized last year. This was a failure in the long run though since it was just a bit too..ambitious..and in the end the most art created for it ends up being a part of Game Art HQ.com now anyway. 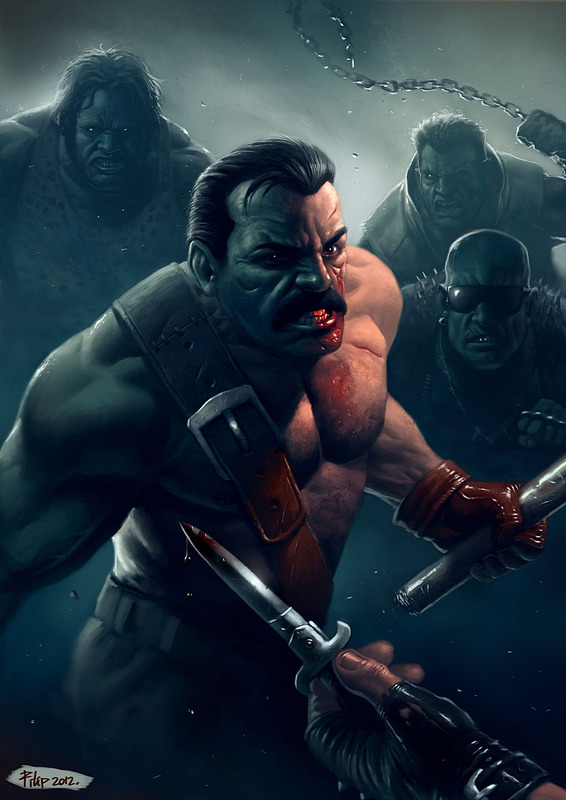 But back to this artwork, which shows Mike Haggar, the Mayor of the fictional “Metro City” in his damn bloody fight against the evildoers of the Mad Gear Gang. You can hit him..kick him..but in the end Mike Haggar will Piledrive you to the ground. Also…bring back Final Fight @ Capcom!